Many bioinformatics software packages and workflows require the user to utilize them from the command line or terminal. SPARTA is no different. The reason the command line interface is utilized is that a great deal of power and flexibility can be gained without the use of a graphical user interface (GUI). Further, a GUI can be difficult to implement across various platforms. To find the command line interface/Terminal on Windows, go to Windows start button -> Search -> Type in: cmd -> Terminal is now open to enter commands. Decompress the SPARTA_Windows-master.zip file by double-clicking on it. Now, drag and drop the decompressed folder onto your desktop. SPARTA expects either compressed (.gz) or uncompressed FASTQ files (.fq or .fastq) as input, with a reference genome file in FASTA format and a genome feature file (.gtf) within the folder that contains the input data. To see an example of appropriate input data, look inside the ExampleData folder within the SPARTA_Windows-master folder. To download a reference genome and genome feature file for your favorite bacteria, go to the Ensembl website. The reference genome and feature file are already present for the ExampleData. The SPARTA workflow requires a few things in order to run: Python, Java, NumPy, and R. If you already have these installed, great! If you don’t, let’s start by downloading the latest version of Python 2 (see image below). 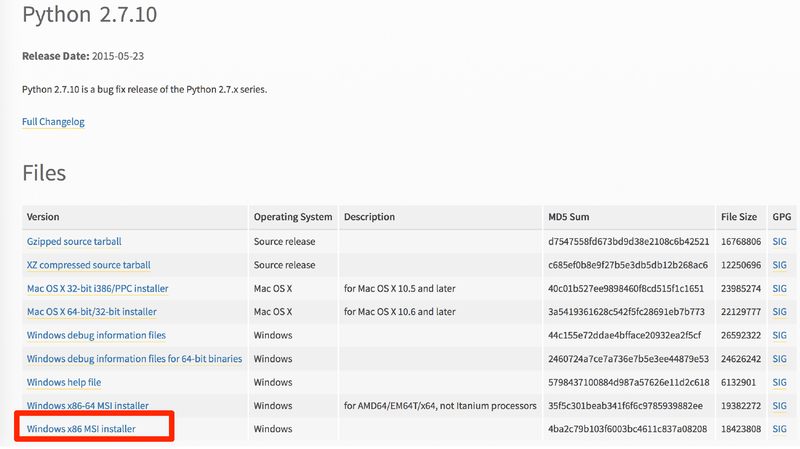 You will want to download and install the red boxed version of Python 2. Follow the prompts to install Python with the default values. If the output does not look something like this, Java is likely not installed and two of the tools require Java to function (Trimmomatic and FastQC). Let’s download and install a suitable version of Java (see image below). 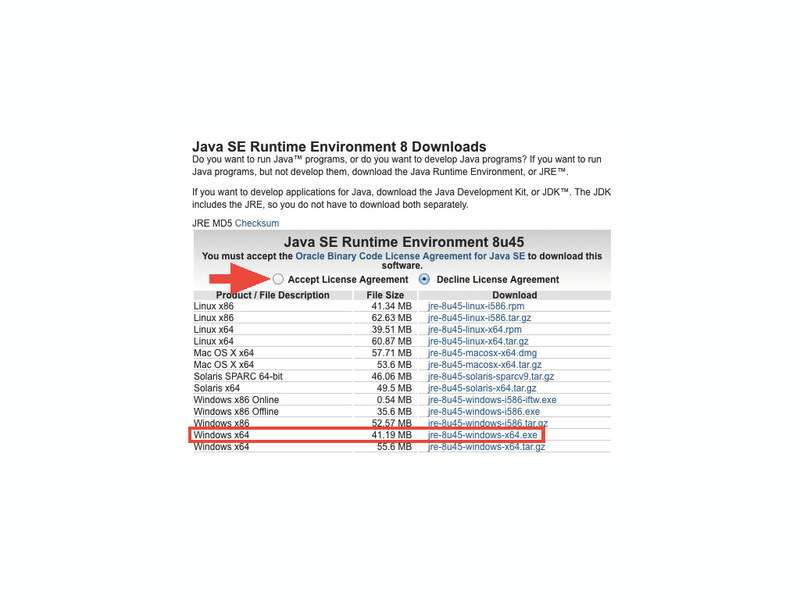 You will want to download and install the red boxed version of Java JRE. 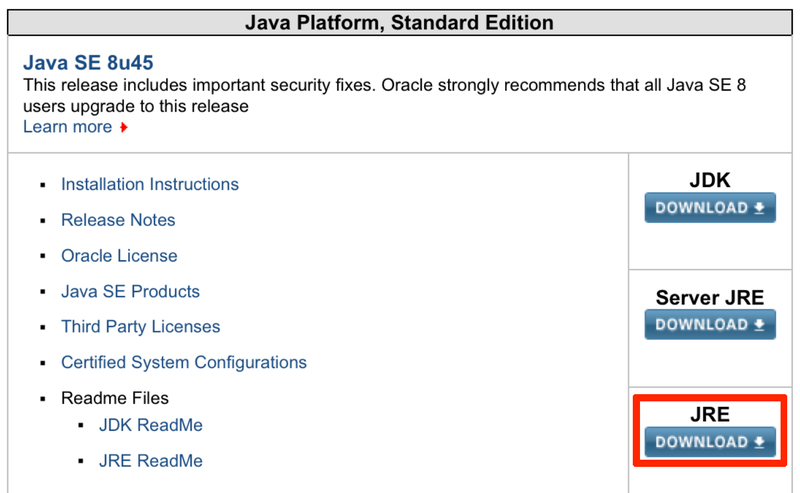 You will also need to click on the button (red arrow) to accept the terms and conditions of using Java JRE. Follow the prompts to install Java. To install the remaining dependencies, SPARTA is distributed with installers for each remaining piece of software, however, there is an ideal order with which to install them. When installing R, make sure that the 32-bit files are also installed. You may have to check the box when the installer presents you with what files to install. Now, there is one remaining batch file called “add_python_and_R_to_path.bat”. This will add the Python, R, and gzip executables to your path so you can run them from the terminal. To execute this script, right-click on the file and then click on the option called “Run as administrator”. Windows may warn you that this script is unsafe because it is from an unknown developer. Click on the “Details” button and then click on “Run anyway”. If this script is not run, SPARTA will not function properly. Congratulations! You’ve installed the necessary dependencies to run SPARTA! Once SPARTA is initialized, the workflow will seek to identify that all of the necessary dependencies are met. If they are not satisfied, a message specific to what is not installed will appear as output in the terminal window. This will start the software and check for dependencies. SPARTA is distributed with some example data. Specifically, it is the first 100,000 reads of each sample from Baker et al..
To begin the analysis, navigate into the SPARTA_Mac-master folder and drag and drop the folder called “ExampleData” out onto the desktop. If you haven’t already, initialize SPARTA from the Terminal. SPARTA assumes the data is located in a folder on the desktop by default. It is easiest if all future analyses have the data in a folder (WITHOUT SPACES IN THE NAME) on the desktop. This is the name of the folder on the desktop that contains the input example data. Hit Enter/Return. From here, the software will trim, align, and count transcript abundance for each sample. All output/analyses are put in a folder that SPARTA generates on the desktop called “RNAseq_Data”. Within this folder are separate folders for each SPARTA run that are denoted by the date (e.g. 2015-06-04). Within these folders are four more folders that separate each step of the analysis and are called: 1) QC, 2) Bowtie, 3) HTSeq, and 4) DEanalysis. There is a known issue here. FastQC will not run non-interactively on Windows (but feel free to contribute to the project and fix this issue!). It is important to QC your data and FastQC can be run interactively by navigating to the FastQC folder: SPARTA_Windows-master -> QC_analysis -> FastQC -> run_fastqc.bat. FastQC should now start and to analyze your trimmed files within FastQC: File -> Open -> RNAseq_Data -> dateofyourrun -> QC -> yourtrimmedfiles. Once the trimming, alignment, and counting are complete, SPARTA will again pause and prompt the user for how many experimental conditions exist within the analysis. 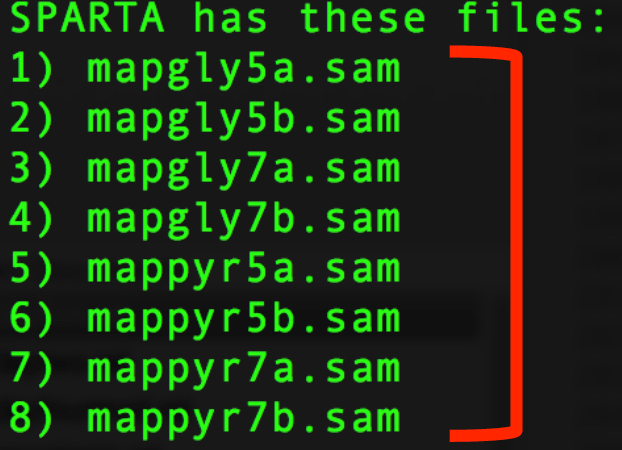 Enter the relevant file names, based on the names given in 'SPARTA has these files', with the replicates separated by a comma. 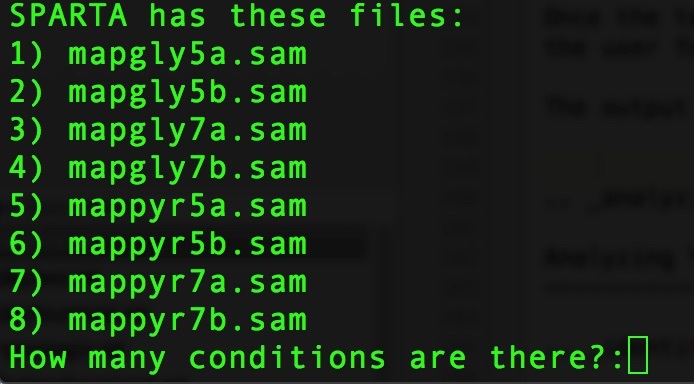 As an example, please see the 'conditions_input_example.txt' in the DEanalysis folder. Now, save the changes by going to File -> Save. Go back to the terminal and hit Enter/Return. From here, the workflow will perform the differential gene expression analysis through edgeR. If a batch effect may be present, the output will attempt to warn the user of the potential, unintended variable that must be accounted for before drawing experimental conclusions. Congratulations! You’ve analyzed RNA-seq data from raw reads to differential gene expression! If you haven’t already, we recommend working through the example data analysis first before attempting to work through your own data set to familiarize yourself with the workflow. As stated in the Introduction, SPARTA expects either compressed (.gz) or uncompressed FASTQ files (.fq or .fastq) as input, with a reference genome file in FASTA format and a genome feature file (.gtf) within the folder that contains the input data on your desktop. To see an example of appropriate input data, look inside the ExampleData folder within the SPARTA_Windows-master folder. Now, to analyze your own data, follow the steps to initialize SPARTA, and start the analysis! If you would like to tweak the analysis options for a given step/tool, have a look at the Altering Workflow Execution Options. 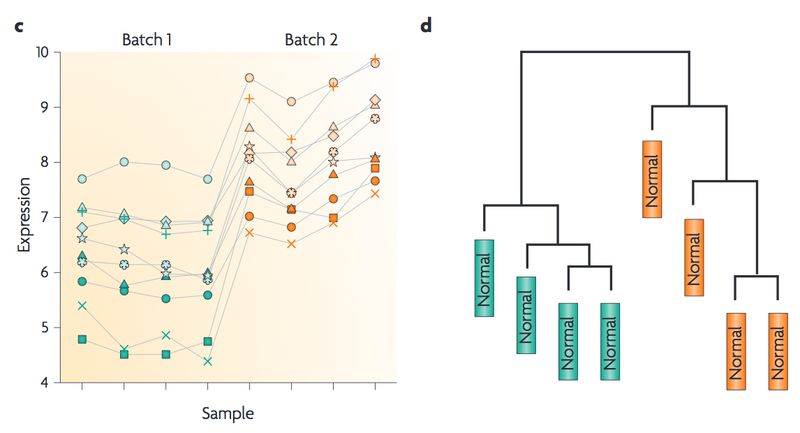 Batch effects can be a source of variation in RNA-seq data that can confound biological conclusions. In fact, there have been documented cases of batch effects present in published studies that led readers to be concerned for the validity of the results. Thus, it is paramount that one address batch effects within their data before drawing biological conclusions from a specific RNA-seq experiment. To illustrate what a batch effect may look like within the data, we will utilize several different plots. This first plot comes from the Nature Reviews Genetics paper where they examine Affymetrix data from a published bladder cancer study. You can quickly see that panels C and D from Figure 1 show that samples from batch 1 (blue) cluster together based on gene expression and samples from batch 2 (orange) cluster together. 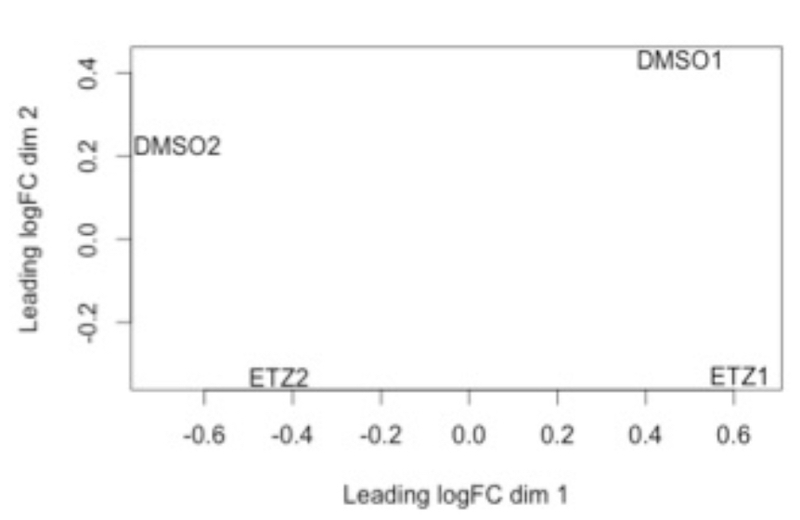 Within RNA-seq data, using SPARTA and the MDS plot generated by edgeR, another example of batch effects within a study comparing Mycobacterium tuberculosis treated with a compound, we can clearly see that the mock-treated samples (DMSO) and compound-treated samples (ETZ) separate based on batch (A vs B) instead of by treatment. Ideally, we would have the samples group together based on treatment as opposed to batch. IMPORTANT! YOU MAY HAVE A BATCH EFFECT! PLEASE LOOK AT THE MDS PLOT! From here, you will want to adjust your model to account for the batch effect. Within edgeR, this can be accomplished through an additive linear model. The documentation for edgeR contains a tutorial on how to deal with batch effects that can be found here. Future implementations of SPARTA will include the ability to adjust for batch effects. SPARTA is capable of allowing the user to alter the parameters associated with each analysis step to be tailored to specific use cases. Below are the different parameters that can be altered and their usage. action is to retain the intermediate files. --verbose             Display more output for each step of the analysis. --lead=LEADING      Set the minimun quality required to keep a base. --trail=TRAILING    Set the minimum quality required to keep a base. SLIDINGWINDOW options. Default is SLIDINGWINDOW:4:15. Set the minimum read length to keep in base pairs. --order=ORDER       Order options: name, pos. Usage: --order=name/pos. --type=TYPE         The feature type (3rd column in GTF file) to be used. © Copyright 2015, Benjamin K Johnson. Revision 3f33cdf4.